If you are looking for something more then just get wet by diving, our crew is for you. On only 25 taxi minutes from the cruise port La Romana you will find the Sharky’s Shop in Bayahibe where our crew will be prepared for the upcoming adventure. EXPERIENCE PRIVATE DIVING WITH SHARKY’S CREW, ALWAYS PERFECTLY TIMED FOR THE PASSENGERS OF CRUISE SHIPS DOCKING IN LA ROMANA. 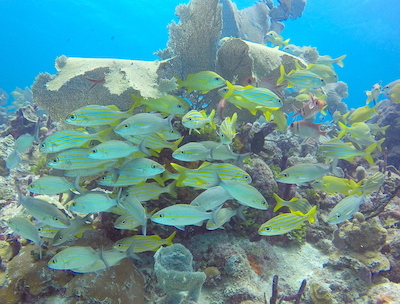 Scuba diving in Bayahibe La Romana is suitable for all levels of scuba divers. Easy shallow dives for the beginners or people that want to learn scuba diving, more advanced dives to St. George wreck or other deep dives for experienced divers. We offer double tank dives with the comfort of scuba diving in small private groups, where nobody is rushing anywhere and nobody is pushing to finish the dives. We do not limit the dive times, only the bottom time and the air are the limits. We have more than two dozens different dive sites to choose from, each with its own flora and fauna making every dive unique and special. 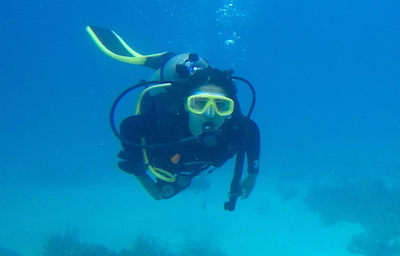 Because of the great weather and the sea conditions, we can go scuba diving in Bayahibe for about 320 days of the year. It might be limited only if we get any bad weather during the busiest time of the hurricane season, which is the end of September and October, other than that the conditions are very good. Book 2 divers for a private half day trip (2 tank dives) with us for 179 USD per diver (equipment, refreshments, private taxi from La Romana and back included). Book 3-5 divers for only 169 USD per diver (all above included as well). Contact Us for prices for bigger groups or families. Our specials are changing often, check back frequently to see what offer during your vacation. Don’t forget to book in advance, we take bookings on first come first served basis and our bookings are filling up fast. BOOK YOUR SPECIAL NOW ! All the photos and videos on the website were taken by Sharky's Crew members: Vlad, Peter, Pierre and our diving friends: Carrie and David.